Full bio to be posted. Rav Barishanski was my great gandfather. With the recent passing of my mother I am searching for information about her family. Thank you for this treasure and I welcome any other information. Another son, Eliezer Barishanski wrote a detailed biography on his father, which is printed as the preface of the above book. Rav Barishanski came to the US around WWI where he served as a Rav in a congregation called “Talmud Torah – Toras Moshe” in the Bronx NY, and was active in the Mizrachi movement. In 1927 he was elected as Rav Hakollel (Rabbi for a Union of Congregations) in Washington DC, and in his duty he was honored to meet with the President of the US. I can not thank you enough for providing this truly treasured information! Mr. Berger, Its my pleasure, I would still like to hear what you do know aout your Grandfather, and perhaps see a photo of him if one is available. Mr. Berger, how is he your great-grandfather? Leonard – I can’t find how to get your email address. I am the great grandson of Rabbi Barishansky. I was named for him by his granddaughter, my mother, Frances Lubens. My mother has a picture of him. I also have a picture of him with his wife Miriam , his daughter Sonia and son-in-law rabbi Jacob Richman taken in January 1948 on the occasion of my oldest brother’s bris. I also have the shingle with his name and title that was outside his home in New York. Rabbi Schneersohn, Rabbi Barishansky and other prominent Jewish clergymen of the Homel district will be put on trial for assuming the “prerogative of State Courts” in advising Jewish litigants to have recourse in Jewish ritual courts of law, according to an announcement made by the Chief Justice Druginsky of Homel. Announcement of the impending arrest and trial of Jewish clericals of the district was made during the trial of Rabbi Schneersohn who is 70 years old. Contending that so-called Jewish courts are part of the traditional function of the rabbi, Rabbi Sneersohn stated he and all other rabbis of Homel and other parts always had exercised the prerogative uninterruptedly. Thereupon Judge Druginsky declared that in view of this statement Rabbi Schneorsohn’s trial will be postponed and proceedings instituted for the same offense against all rabbis of the Homel district. Rabbi Barishansky who has already served 7 months’ imprisonment for attacking in his speeches the Jewish section of the Communist Party, declared to the Jewish Telegraphic Agency he was untroubled by the possibility of further imprisonment for this offense. He said he regretted only that it may delay his departure to Palestine where he intends to settle and where, reports have it, he is to become Chief Rabbi of Jaffa. At a meeting of representatives of more than thirty synagogues and organizations, Rabbi Mordecai Barishansky, was unanimously elected Rabbi of the newly established Jewish Community of Philadelphia, known as Adas Israel. 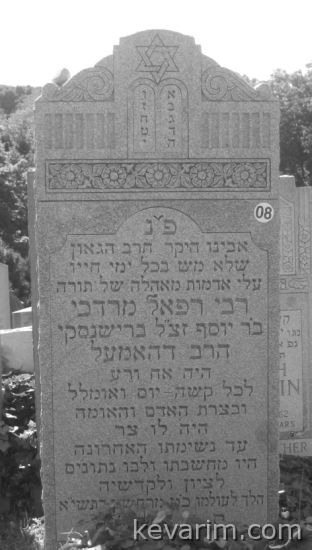 My maternal great grandmother was Lima Barishansky, who married Chaim Schwartz. My mother has always said that Rabbi Barishansky was a cousin, but I don’t know how, and would appreciate it if someone can provide information on the Rabbi’s family. My parents were married by Rabbi Barishansky in NY in 1941, and they will celebrate their 70th anniversary this November. My mother remembers Shulem and another son Jack. She also remembers that Rabbi Barishansky had a wonderful sense of humor. My name is Taras Yisroel Prakapenka, I am a Gabbai of Gomel Jewish Religious Community (Hommel, Belarus). We are the descendants of the Jewish Community, led by Your Grandfather, rabbi Raphael Mordichai Barishansky, ZATSAL. On 29th of Cheshvan it will be his Yahrzeit, 66 years from His passing away. We would like to make a seudat mitzvah, Mishnah studies in Gomel Yeshiva and Jewish Community, would really appreciate if You can share with us about several personal stories from His life to tell our students about Him more. would be glad to be in touch with His grand and greatgrand children! My father was born in 1912 and left Russia in 1921. He went back to visit in 1937 (It was then Polish). He stated that he had no family in South Africa other than his sister and father. His mothers maiden name was Barishansky. She perished in the flu pandemic of 1917. He said he was related to all of the Barishanskys. The family split into Barishansky and Ofsciewics to avoid the Russian military draft. He was born in Korelitz. Except for an uncle on his fathers side, all of his family perished in the Shoa. I currently live in the USA.